This NSi Industries 7300-L mechanical time switch accepts 120 VAC input and its 3PST output contacts can activate a 40 amp load or 2 hp motor, and is suitable for use where on/off operation is required at the same time each day. A spring-wound backup power supply preserves timer settings up to 16 hours. A spoke-type switch allows operation to be skipped for individual days of the week. The timer includes one pair of contact trippers and has a minimum On cycle time of 20 minutes and a minimum Off cycle time of 75 minutes. The timer accommodates up to 12 pairs of contact trippers (not included). 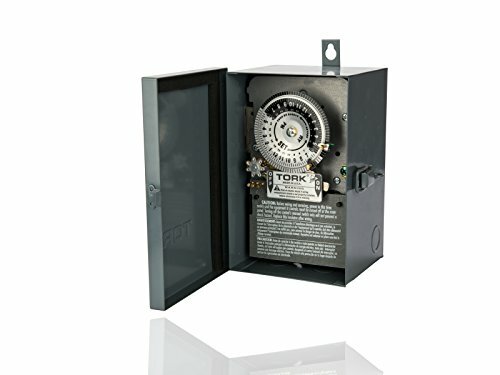 The three-pole single-throw (3PST) contacts are housed within a metal enclosure that meets NEMA-3 standards for water resistance and has a lockable hasp. The enclosure is suitable for both indoor and outdoor use and mounts to an external surface. This mechanical timer is Underwriter Laboratories (UL) listed and Canadian Standards Association (CSA) certified for quality assurance and is suitable for controlling lighting, heaters, and equipment motors. Switch type Mechanical 24-hour timer with contact trippers for one on/off cycle (included). Accommodates 11 pair additional trippers (not included). Skip-a-day operation. Automatic switches are used to turn on or off electrical devices and are activated by time, light, and motion. Time activated switches (also known as timers) operate at preset time intervals during a daily or weekly period and can be either mechanical or electronic. Mechanical timers feature a dial with multiple pins to set the on/off time intervals. Electronic timers feature an LCD display and pushbuttons to set the time intervals. Light activated switches (also known as optical or photo) operate when ambient light levels reach preset values, generally measured in foot candles. Motion-activated switches (also known as motion sensors) operate when an electronic field of a preset range is interrupted. These switches can include energy saving logic that uses combinations of time, light, and motion to operate and can include one or more device outlets or circuit contacts. Automatic switches are used to control indoor lights, outdoor lights, appliances, and small equipment motors. If you have any questions about this product by TORK a brand of NSi Industries, LLC, contact us by completing and submitting the form below. If you are looking for a specif part number, please include it with your message.